I thought It would be fun to have a little hand out for some of my blogging friends I can't wait to meet while at convention! So I ordered personalized M&M's and they are soooo cute! I used some little bottles I had left order from another project and added labels to the front, filled them with M&M's and added a ribbon and daisy. That's IT I'm homeschooling Brady, dropping everything and going to convention now. LOL (JK) These are ADORABLE!! This is just too precious and so clever! Blessings to you! Becky-- I ordered these for my wedding!!!!!! Great minds think alike!!!! That's an adorable idea! thanks for sharing. That is too stinking cute!!!! You always have the coolest ideas....thanks for sharing with us! Becky, those are so stinkin' cute!! I wish I was going to convention. Have a fantastic time!! You are so thoughtful and giving. Your blog buddies will love this special treat! I got to go to convention last year for the first time and it was such a wonderful experience. I hope to go again, but not this year. Have a super time! I'm sending swaps by my upline, Christie Daugherty, so at least a bit of me is going!! Wish I was there for a bottle of those cute M&M's!! Hope to run into you at Convention. Always love checking what you've come up with next. WHATTTTTTTTTTTTTT GIRL YOU KNOW I'll be stalking looking for you! ROFL>>>> (((HUGS))) was gonna look for you anyway but NOW I REALLY NEED TO FIND YOU! ROFL!!! (((HUGS).. PSSSSSSSSSS WE GOING TO CONVENTION!! SQUUUUUUUUUUUUUEALLLL!!! Adorable. They will love it. Those M&M jars are just adorable! I wish I was going to convention so I could meet you. I consider you one of my favorite blog friends! Becky, sorry I am missing convention this year, I would have loved to have met you in person - especially if you have these cute m&m's!! That is so cute. What a great idea! Have a blast at conventiion!!! Oh my word!!!!!! This is the cutest and most clever goodie ever! Curious what the bottles are left over from. Ü Great way to go "green". 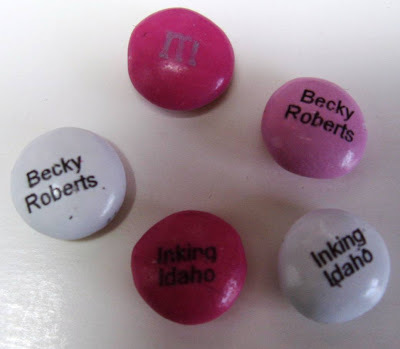 How fun is that Becky...m & m's with your name on it - you guys have all the cool stuff. Nice Work. Becky these are adorable. I hope I find you at convention cause I really want to meet you in real life and get one of these cute little goodies. Super cute!Wish I was going to convention!! Oh My Gooooooodness.. these are soooo cute! What a FUN idea!! WOW.. I'm impressed!! Awesome idea! These really turned out cute! I will be at convention too! OH MY WORD!!!!!!!!!! Becky, you think of everything! Wish I was going to convention just to get one of those cuties! These are just toooo adorable !!!!! 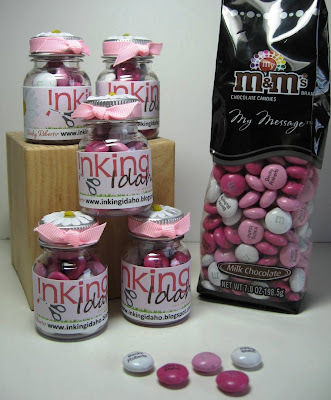 Wow, what a fantastic idea and what a great firm to actually make personalized sweeties. I'm gobsmacked. I've never heard of anything like that here in the UK. Mind you, you are the greatest. This is a very clever idea! Love it!! Wish I was one of the lucky ones at convention getting one. Maybe I'll run into you and I can swap you a 3-D for one. LOL! That's cute! This is a great idea. Please can you give me the link of where you ordered the personalized M&M. I'm looking for ideas and want to do something similar for my son First Communion in tones of blue and white. Thank you for sharing your ideas. I love all the stuff you do. I have a blog award for you, so come on by and pick it up on my blog! How cute are you... The label is so adorable. The lucky recipients with think of you every time they look at this little treasure... You never seise to amaze me..
We need to have a catty crew hook up for sure.. I LOVE them! Too bad I am due in 6 weeks, no traveling to convention for me! Definately next year! Have a blast!! Becky, you have been so helpful to me that I wish that I was able to go to convention and meet you! Ok, I want the m&ms too! Keep up the great work and keep the ideas coming. Have a blessed trip. What a wonderful idea! They are really cute! Oh how cute and fun! I wish I was going to convention this year and meeting you! have fun! can't wait to hear all the details.